The AppleUsers Spotlight has been on hiatus for a few years now, mainly due to the working and family commitments of various team members. It was intended to be a brief one, but has ended up been a tad longer than expected. We will see what comes around after publishing this issue. The Spotlight contained articles covering a wide range of topics relating to all Apple products. There are reviews of software for the Mac and iOS devices, plus lots of helpful hints and tips. For a bit of fun, we even have a regular column that features different recipes for the actual fruit! For this Software Freedom Day 2016 Sampler Edition, we have scoured though all our back issues to find any articles we’ve published regarding Free and Open Source Software (FOSS) and bought them all together, along with a few other interesting articles, to give you an introduction to the style of our free, digital format, magazine. 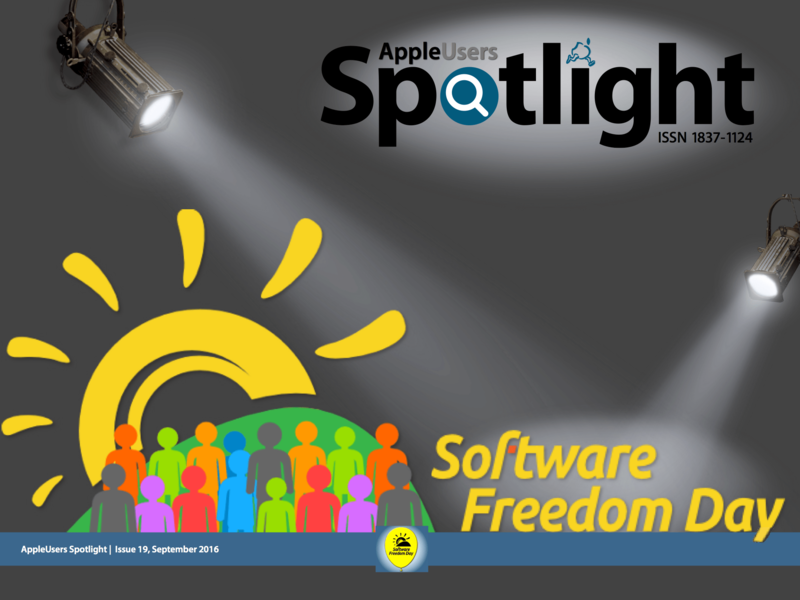 This issue has also been included on the Spotlight on FOSS 2016 DVD that is been distributed, free of charge, at participating Software Freedom Day 2016 Events and various Apple User Groups around the globe.